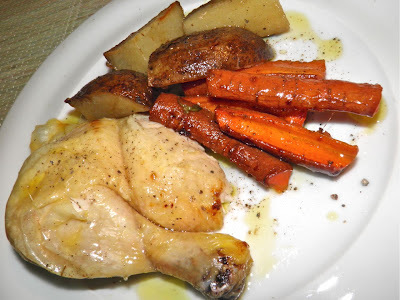 Slow cooked chicken and vegetables. Fall off the bone tender. I'm not writing about “slow food” as the trendy definition implies. This post is nowhere near that complicated or environmentally "preachy" (although I do believe strongly in the values of the Slow Food Movement). This recipe is about the actual definition of “slow” – by which I mean this recipe takes an afternoon to make. All of it. From 1 pm to 5 pm. Sometimes when you have the time, it’s fun to set something on the fire and let it go. This is especially true if it’s the kind of cooking that doesn’t take constant tending. That’s this recipe. Put everything in a roaster and forget it for 4 hours. Yes, that’s right. 4 hours. I bet you didn’t realize you could use your oven as a slow cooker. The tabletop slow cooker is merely a convenience item from 40 years ago. 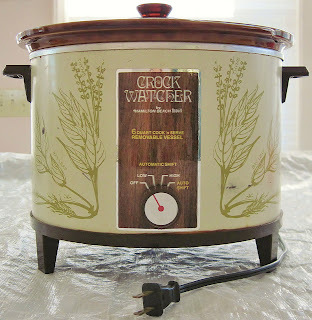 "crock watcher" by Hamilton Beach. The design screams 1970s. For as long as humans have been using fire slow cooking has been recognized as a method to tenderize less desirable cuts of meat. There was a time not all that long ago when eating “nose-to-tail” (all of an animal) was a financial requirement so tougher cuts came with the territory. Tough cuts of meat especially benefit from long, slow cooking. The ligaments and collagen often found in them breaks down making them much more palatable and the juices self-baste the meat as it cooks. As our modern mechanization of produce increased and society sped up, time to spend in the kitchen was no longer there. With both partners working the requirement for fast meals became the norm, as opposed to the exception (sadly). But the desire to have a slow cooked meal on the table was still part of our remembered culture. So in the 1970s, Rival Company marketed a low temperature cooker with a removable crock (ceramic) liner that was sort of shaped like a pot. Crock. Pot. Crock Pot. I was given one and in preparing to sell the house I have yet to find it. I must have really stowed it far back in some storage space. I was always a little “ashamed” to have one. I don’t know why. I guess because it’s effortless to use it. Cooking to me should take some effort. I feel it shows your love for those who eat what you make. I guess I should re-examine my priorities. What’s the difference between a 3’x3’ slow cooker and one that fits on your counter? I would hazard a guess that’s it really not too much. Maybe my aversion has something to do with the over-hyped marketing of the “time saving device” from the 1970s. I have the same aversion to fondue pots and Chalet-style architecture. Trends from the same time period…hmmm. Try this recipe. You can even put it on the oven and then go about your day. It’s amazingly fall-off-the-bone tender. But you do have to use the oven… Don’t stuff a whole chicken in a crock pot. but passable. And twice as juicy. Place about 2 tablespoons of olive oil in a 10x13 (or similar sized) roaster. Put 3 of the sprigs of sage in the oil. 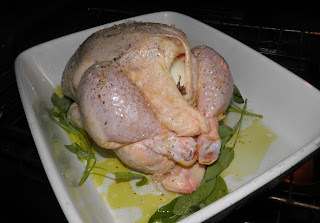 Shove a whole head of garlic, the remaining two sprigs of sage and an onion up inside the chicken. Tie the legs together so the onion and all won’t come out during roasting. Roast for 4 hours. Check at 3 hours. The internal temperature needs to read 180°F on a meat thermometer. 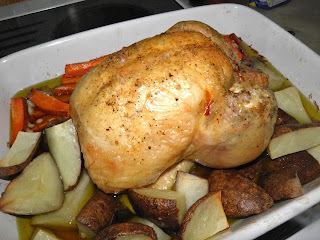 Roasting time will vary depending on the size of the chicken.